You are currently browsing the monthly archive for June 2010. If I understand it correctly, to be truly human (according to Dietrich Bonhoeffer), if a person is truly to be a person, then he or she understand his or her relationship to others. We exist not for ourselves, but for the sake of others! Lois and I have been in Colorado the past few days. We are still here. Today, I have access to my laptop. Colorado is a place where it is easy to praise God for His creation! 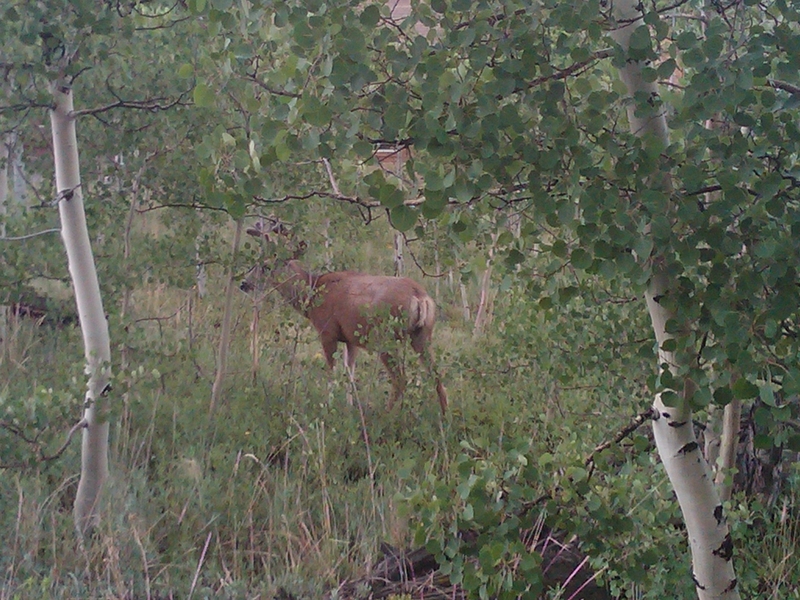 It was easy to get near the deer! Human beings exist only in relationship to, and responsibility for, other human beings. This relationship comprises the social intention, or sociality, of theology (Stephen R. Haynes and Lori Brandt Hale, Bonhoeffer for Armchair Theologians, 79). It is not an overstatement to say that the central idea of Bonhoeffer‘s theological work are present in or informed by his dissertation Sanctorum Communio: A Dogmatic Inquiry into the Sociology of the Church. Completed when he was (just!) twenty-one years old, the book considered the church as a reality in which “Christ exists as community.” As the congregation gathers and experiences together God’s grace in word, sacrament, and service, the church becomes the presence of Christ in the world (Stephen R. Haynes and Lori Brandt Hale, Bonhoeffer for Armchair Theologians, 78). This is most certainly a vital message that the twenty-first century needs to hear as well! But Dietrich remained torn between remaining in England, returning to the university, traveling to India, and starting a Protestant monastic community. I the end he would be drawn to the latter option under the aegis of the Confessing Church (Stephen R. Haynes and Lori Brandt Hale, Bonhoeffer for Armchair Theologians, 41). Copyright (c) 1996 First Things 65 (August/September 1996): 27-30. The decision to attempt the assassination of Hitler, to “cut off the head of the snake,” was difficult for many of the conspirators involved in the 1945 “July 20th Plot.” But it was particularly tormenting for the Lutheran pastor Dietrich Bonhoeffer, who had long felt the attraction of pacifism and who had planned a sojourn in India with Gandhi. Some of Bonhoeffer’s later readers have looked to his writings for a general rationale for opposing tyrannical power even to the point of violence. 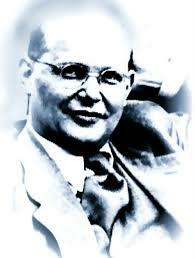 But they have been disappointed, for Bonhoeffer never penned a full- fledged justification of his determination to resist. 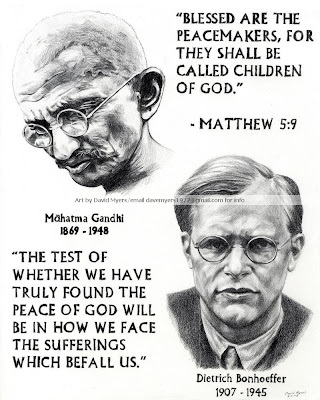 by which he meant that Gandhi exemplified Jesus’ Sermon on the Mount better than Western Christians. Bonhoeffer was particularly intrigued by the possibility of applying nonviolent methods in resisting Nazi tyranny (Stephen R. Haynes and Lori Brandt Hale, Bonhoeffer for Armchair Theologians, 40). But Bonhoeffer perceived the situation as: “We are immediately faced with the decision: National Socialist or Christians!” (Stephen R. Haynes and Lori Brandt Hale, Bonhoeffer for Armchair Theologians, 37-38). What if we were faced with a similar situation? Would we stand up for what was right in the eyes of God?